Regionalentwicklung Oberallgäu - An association supporting the Region: Regionalentwicklung Oberallgäu e.V. The Oberallgäu Region has to deal with those challenges by a strategy which is adjusted to the region’s particular features. For that purpose an association was founded in the year 2004, the so called “Regionalentwicklung Oberallgäu e.V.”. The association represents the LEADER Action Group in the Oberallgäu Region and is therefore, along with the Department of Food, Agriculture and Forestry in Kempten (AELF), in charge of the LEADER programm. The association is responsible for the development of the region and fosters the implementation of innovative projects. Municipal representatives as well as business and social partners equally decide on the support of measures in terms of common aims and mission statements. 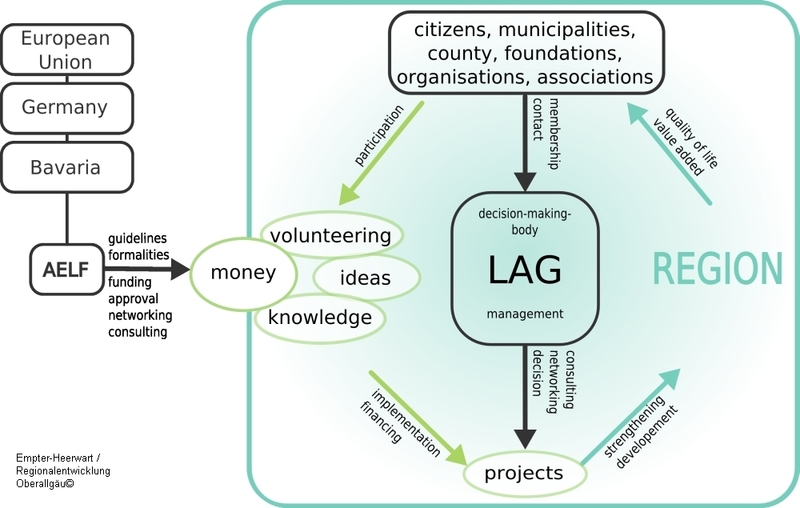 In this process, the LAG office acts as a contact point concerning all kinds of questions. An important aspect is the citizens’ participation both on the decision level and on the level of implementation. What is happening until 2020? How do we want to develop? What do we want to achieve? And how can we manage this? Regional actors implement innovative projects in the Oberallgäu Region which strengthens and develops the region as a whole. 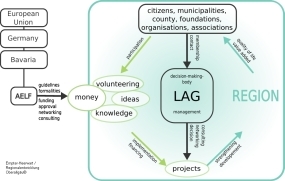 Citizens and actors benefit from the realisation of new projects or their active cooperation within the association. Quality of life enhances, local supply is ensured, regional value added increases, jobs and alternative income streams are created and the quality of leisure time facilities and offers for tourists increases. Moreover, the public gets sensitised for the matters of rural development and synergy effects emerge. The cooperation project “LandZunge” is one of the most qualified and most professional projects regarding the marketing of regional products of high quality. About 80 innkeepers as well as producers, suppliers and logisticians are aiming at– as partners of the network “LandZunge” – an increased use of regionally produced products in the catering sector which enhances the value added in the Allgäu region. Using the existing infrastructure of the “LandZunge” project as a basis and benefitting from the experiences made, the project “VitalZunge” targets the increased use of regional products in large-scale catering establishments. A similar project, supporting the use of regional products on alp cottages, is called “Allgäuer Alpgenuss”. The project “Bürgerbrücke” is based on the involvement of citizens working on a voluntary basis. Citizens of two rural municipalities have built up a swing bridge across the river “Iller” to create a connection between their municipalities again as the ferry service closed down. The project “Freiwilligenagentur” aims at strengthening citizens’ involvement and encouraging the rural population to work in a voluntary capacity. The agency coordinates and fosters the networking in the region to gather offers for people which want to get involved in working as a volunteer. Guests from all over Europe visited the Oberallgäu in the last years to learn about our regional management and best practice projects. If you are interested in visiting us as well, plaese contact us for further information. We'll be glad to create an interesting programm.